I arrived in Paris in the afternoon off the TGV from Bern. I had seen the sights on previous trips and wandered, now, as I might in London with no itinerary and no real aim, just enjoying the amble through the daily life of one of the world’s great cities. 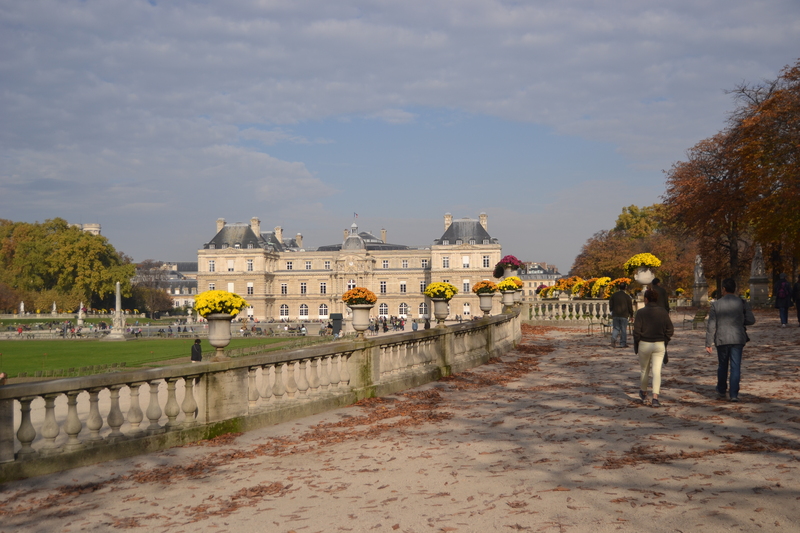 I walked down Rue Volney, hung a left into Rue des Capucines, then a right and down through Place Vendome to the Jardin des Tuileries and along the right bank to the Tower. I crossed there and backtracked along the left bank and went to the Musée d’Orsay, where I stayed until they turned people out. I love the old Beaux-Arts station building, and the Manets, the Monets, the Van Goghs, the Cézannes, and Renoir’s Bal du Moulin de la Galette and Caillebotte’s Raboteurs de Parquet, which I had prints of on my wall as a student. I stopped for dinner at a bistro busy with a garrulous after-work crowd. There were old cycle racing posters and desilvered mirrors on the walls, and hams and saucisson hanging over the counter, and a short menu of bistro staples. I ordered one of those salads the French do so well, with a nice mix of leaves and walnuts tossed in a vinaigrette, topped with slivers of hard, sharp cheese and greedy slices of Bayonne ham, and followed that with crispy, gelatinous pieds de cochon swilled down with a carafe of red. I had arranged to have lunch the next day with a local girl whom I knew when she lived in London, but she cried off and I had the day to myself. I was out early and walked by a different route down to the river and crossed Pont Neuf over the prow of Ile de la Cité into the old bohemian quarter to look for the places which Hemingway wrote about in A Moveable Feast and The Sun Also Rises. When I had done with Hemingway, I walked back up to Place de la Concorde where I had seen the Gallardo Spyder the day before with “Drive it for 89€” on the side. I guessed there would be more to it than that, but no. Show them your licence, pay them the money and sign to confirm that you have not been drinking or smoking, and it is yours for the next twenty minutes. I prodded the starter button and blipped the throttle and the V10 roared, and the guy directed me on a route through town which took in the big sights but avoided the worst of the traffic. Alongside the river, top down, the engine snarling behind me, then – as invited – into a tunnel and burying the accelerator in the carpet. The Gallardo streaked forward, the howling V10 reverberated off the walls of the tunnel and a motorbike in the right-hand lane was sucked back instantly into the distant past. Out into daylight, then through another tunnel, foot down again, then up to the Place de l’Étoile and down the Champs-Élysées, back to where I started. I had just enough time, then, for a quick lunch at a bistro on the way to my hotel. It was an old, wood-panelled place with black and white photos of a bygone Paris on the walls. The husband and wife team who ran it seemed to know most of the customers well. She stayed at their tables to chat after taking their orders; he interposed now and then from the bar across the room. Rillettes, a bavette of beef with shallot sauce and fries, a glass of red, a bottle of water and an espresso for the price of a pizza and Coke in London. I love the democratic food culture in France. Focussed women in designer suits sat a table away from bantering men in paint-spattered overalls – unthinkable in the class-bound, proudly unequal UK. I grabbed my bags and took a bus to the Gare du Nord for the Eurostar home. The neighbourhood was no smarter than it had been when I was last there, ten years before, and I had arrived late at night and had to walk round drunks sprawled across the pavements, but it felt marginally safer in daylight. Love the picture of the Eiffel Tower, great shot! Thanks. I can’t really claim credit for it though, except minor editing. The guy who was in with me took it.